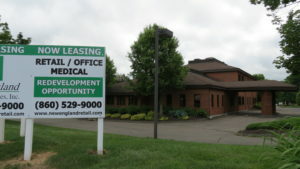 Matt Halprin, Vice President (halprinm@newenglandretail.com) and Steve Becker, Broker (sbecker@newenglandretail.com) at New England Retail Properties, Inc., are proud to announce that New England Retail Properties has been hired to Exclusively Represent the owner of 1295 Blue Hills Avenue in Bloomfield, Connecticut in leasing/selling their property, which consists of 2 commercial buildings (8,000 SF and 2,750 SF) on 1.96 Acres of Land. This property is located in a high traffic retail/industrial area boasting 24,751 businesses within a ten mile radius. The property can be leased as-is or as a redevelopment opportunity. High profile surrounding tenants include Amazon Headquarters, HomeGoods Headquarters, Home Depot, Walgreen’s, Cumberland Farms, Dunkin Donuts and more.